The SRS (Supplemental Restraint System)front airbags are designed to providefurther protection for the driverand front passenger in addition to theprimary safety protection provided bythe seat belts. Your vehicle is equipped with “ADVANCEDAIRBAGS” designed based on US motorvehicle safety standards (FMVSS208). Theairbag system controls airbag deploymentpower for the driver and front passenger.The driver airbag system consists of thedriver’s seat position sensor, etc. Thefront passenger’s airbag system consistsof the front passenger occupant classificationsensor, etc. In response to a severe frontal impact,the SRS front airbags work with the seatbelts to help reduce injury by inflating.The SRS front airbags help reduce injuriesmainly to the driver’s or front passenger’shead or chest caused by hitting the vehicleinterior. The SRS front airbag system is designedonly as a supplement to theprimary protection of the driver andfront passenger seat belt systems.The driver and front passenger canbe killed or seriously injured by theinflating airbags if they do not wearthe available seat belts properly.During sudden braking just beforea collision, an unrestrained driveror front passenger can move forwardinto direct contact with orclose proximity to the airbag whichmay then deploy during the collision.To ensure maximum protectionin an accident, the driver and allpassengers in the vehicle mustwear their seat belts properly. Wearinga seat belt properly during anaccident reduces the chances ofdeath or serious injury or beingthrown out of the vehicle. For instructionsand precautions concerningthe seat belt system, see “Seatbelts” on page 58. Improperly seated and/or restrainedinfants and children can be killedor seriously injured by the deployingairbags. An infant or child whois too small to use a seat beltshould be properly secured using achild restraint system. Toyotastrongly recommends that all infantsand children be placed in therear seat of the vehicle and properlyrestrained. The rear seat is thesafest for infants and children. Forinstructions concerning the installationof a child restraint system, see“Child restraint” on page 86. The SRS front airbags are designed todeploy in severe (usually frontal) collisionswhere the magnitude and durationof the forward deceleration of the vehicleexceeds the designed thresholdlevel. The SRS front airbags will deploy if theseverity of the impact is above the designedthreshold level, comparable to anapproximate 25 km/h (15 mph) collisionwhen the vehicle has the impact straightinto a fixed barrier that does not move ordeform. However, this threshold velocity will beconsiderably higher if the vehicle strikesan object, such as a parked vehicle orsign pole, which can move or deform onimpact, or if the vehicle is involved in anunderride collision (e.g. 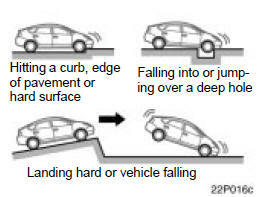 a collision inwhich the front of the vehicle “underrides”,or goes under, the bed of a truck, etc.). It is possible that in some collisionswhere the forward deceleration of the vehicleis very close to the designed thresholdlevel, the SRS front airbags and theseat belt pretensioners may not activatetogether. The SRS front airbags are generally notdesigned to inflate if the vehicle is involvedin a side or rear collision, if itrolls over, or if it is involved in a low−speed frontal collision. But, whenever acollision of any type causes sufficientforward deceleration of the vehicle, deploymentof the SRS front airbags mayoccur. The SRS front airbags may also deployif a serious impact occurs to the undersideof your vehicle. Some examplesare shown in the illustration. The SRS front airbag system consistsmainly of the following components andtheir locations are shown in the illustration. The airbag sensor assembly consists of asafing sensor and airbag sensor. The front airbag sensors constantly monitorthe forward deceleration of the vehicle.If an impact results in a forward decelerationbeyond the designed threshold level,the system triggers the airbag inflators. Atthis time a chemical reaction in the inflatorsvery quickly fills the airbags with non−toxic gas to help restrain the froward motionof the occupants. The front airbagsthen quickly deflate, so that there is noobstruction of the driver’s vision should itbe necessary to continue driving. When the airbags inflate, they produce aloud noise and release some smoke andresidue along with non−toxic gas. Thisdoes not indicate a fire. This smoke mayremain inside the vehicle for some time,and may cause some minor irritation tothe eyes, skin or breathing. Be sure towash off any residue as soon as possibleto prevent any potential skin irritation withsoap and water. If you can safely exitfrom the vehicle, you should do so immediately. Deployment of the airbags happens in afraction of a second, so the airbags mustinflate with considerable force. While thesystem is designed to reduce serious injuries,primarily to the head and chest, itmay also cause other, less severe injuriesto the face, chest, arms and hands. Theseare usually in the nature of minor burnsor abrasions and swelling, but the force ofa deploying airbag can cause more seriousinjuries, especially if an occupant’shands, arms, chest or head is in closeproximity to the airbag module at the timeof deployment. This is why it is importantfor the occupant to: avoid placing anyobject or part of the body between theoccupant and the airbag module; sitstraight and well back into the seat; wearthe available seat belt properly; and sit asfar as possible from the airbag module,while still maintaining control of the vehicle. Parts of the airbag module (steering wheelhub, airbag cover and inflator) may be hotfor several minutes after deployment, sodo not touch! The airbags inflate onlyonce. The windshield may be damaged byabsorbing some of the force of the inflatingairbag. The driver sit as far back as possiblefrom the steering wheel whilestill maintaining control of the vehicle. The front passenger sit as far backas possible from the dashboard. All vehicle occupants be properlyrestrained using the available seatbelts. For instructions and precautions concerningthe seating position, see“—Front seat precautions” on page52. Do not sit on the edge of the seator lean against the dashboard whenthe vehicle is in use, since thefront passenger airbag could inflatewith considerable speed and force.Anyone who is up against, or veryclose to, an airbag when it inflates,can be killed or seriously injured.Sit up straight and well back in theseat, and always use your seat beltproperly. Toyota strongly recommends thatall infants and children be placed inthe rear seat of the vehicle and beproperly restrained. Do not hold a child on your lap orin your arms. Use a child restraintsystem in the rear seat. For instructionsconcerning the installation ofa child restraint system, see “Childrestraint” on page 86. Do not put anything or any part ofyour body on or in front of thedashboard or steering wheel padthat houses the front airbag system.They might restrict inflation orcause death or serious injury asthey are projected rearward by theforce of the deploying airbags. Likewise,the driver and front passengershould not hold objects in theirarms or on their knees. Do not modify or remove any wiring.Do not modify, remove, strikeor open any components, such asthe steering wheel pad, steeringwheel, column cover, dashboardnear the front passenger airbag,front passenger airbag cover, frontpassenger airbag or airbag sensorassembly. Doing so may prevent thefront airbag system from activatingcorrectly, cause sudden front airbagsactivation of the system ordisable the system, which could resultin death or serious injury. Failure to follow these instructionscan result in death or serious injury.Consult your Toyota dealer about anyrepair and modification. If you wish to modify your vehicle fora person with a physical disability,consult your Toyota dealer. It maydangerously interfere with the SRSfront airbags operation. Do not perform any of the followingchanges without consulting yourToyota dealer. Such changes can interferewith proper operation of theSRS front airbag system in somecases. This indicator comes on when the “IG−ON” mode is enabled. It goes off afterabout 6 seconds. This means the SRSfront airbags are operating properly. The SRS front airbags have been inflated. 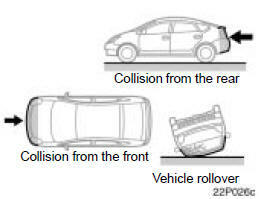 The front of the vehicle (shaded in theillustration) was involved in an accidentthat was not severe enough to causethe SRS front airbags to inflate. The pad section of the steering wheelor front passenger airbag cover(shaded in the illustration) is scratched,cracked, or otherwise damaged. Do not disconnect the 12 volt batterycables before contacting your Toyotadealer. The SRS (Supplemental Restraint System)side airbags and curtain shield airbagsare designed to provide furtherprotection for the driver, front passengerand rear outboard passengers inaddition to the primary safety protectionprovided by the seat belts. In response to a severe side impact, theSRS side airbags and curtain shield airbagswork with the seat belts to helpreduce injury by inflating. The SRS sideairbags help reduce injuries mainly to thedriver’s or front passenger’s chest and theSRS curtain shield airbags help reduceinjuries mainly to the driver’s, front passenger’sor rear outboard passenger’shead. The SRS curtain shield airbags may activateeven when the side airbags are notactivated. The SRS side airbag and curtainshield airbag system is designedonly as a supplement to the primaryprotection of the driver, frontpassenger and rear outside passengerseat belt systems. To ensuremaximum protection in an accident,the driver and all passengers in thevehicle must wear their seat beltsproperly. Wearing a seat belt properlyduring an accident reduces thechances of death or serious injuryor being thrown out of the vehicle.For instructions and precautionsconcerning the seat belt system,see “Seat belts” on page 58. Do not allow anyone to lean his/herhead or any part of his/her bodyagainst the door or the area of theseat, front pillar, rear pillar or roofside rail from which the SRS sideairbag and curtain shield airbagdeploy even if he/she is a childseated in the child restraint system.It is dangerous if the SRS side airbagand curtain shield airbag inflate,and the impact of the deployingairbag could cause death or seriousinjury to the occupant. Improperly seated and/or restrainedinfants and children can be killedor seriously injured by the deployingairbags. An infant or child whois too small to use a seat beltshould be properly secured using achild restraint system. Toyotastrongly recommends that all infantsand children be placed in therear seats of the vehicle and properlyrestrained. The rear seats arethe safest for infants and children.For instructions concerning theinstallation of a child restraint system,see “Child restraint” on page86. 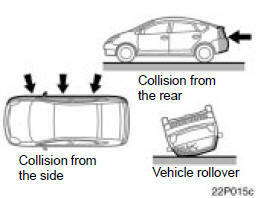 The SRS side airbag and curtain shieldairbag system may not activate if thevehicle is subjected to a collision fromthe side at certain angles, or a collisionto the side of the vehicle body otherthan the passenger compartment asshown in the illustration. The SRS side airbags and curtain shieldairbags are designed to inflate when thepassenger compartment area suffers a severeimpact from the side. The SRS side airbags and curtain shieldairbags are generally not designed toinflate if the vehicle is involved in afront or rear collision, if it rolls over,or if it is involved in a low−speed sidecollision. The SRS side airbag and curtain shieldairbag system consists mainly of the followingcomponents, and their locations areshown in the illustration. The SRS side airbag and curtain shieldairbag system is controlled by the airbagsensor assembly. The airbag sensor assemblyconsists of a safing sensor andairbag sensor. In a severe side impact, the side andcurtain shield airbag sensor and/or thecurtain shield airbag sensor trigger(s) theside airbag inflators and/or the curtainshield airbag inflators. At this time achemical reaction in the inflators quicklyfills the airbags with non−toxic gas to helprestrain the lateral motion of the occupants. When the airbags inflate, they produce afairly loud noise and release some smokeand residue along with non−toxic gas. Thisdoes not indicate a fire. This smoke mayremain inside the vehicle for some time,and may cause some minor irritation tothe eyes, skin or breathing. Be sure towash off any residue as soon as possibleto prevent any potential skin irritation withsoap and water. If you can safely exitfrom the vehicle, you should do so immediately. Deployment of the airbags happen in afraction of a second, so the airbags mustinflate with considerable force. While thesystem is designed to reduce serious injuries,it may also cause minor burns orabrasions and swelling. Front seats as well as parts of the frontand rear pillars, and roof side rail may behot for several minutes, but the airbagsthemselves will not be hot. The airbagsare designed to inflate only once. Remain properly seated with theirbacks upright and against the seatsat all times. Do not allow anyone to lean againstthe door when the vehicle is in use,since the side airbag and curtainshield airbag could inflate with considerablespeed and force. Otherwise,he/she may be killed or seriouslyinjured. Special care shouldbe taken especially when you havea small child in the vehicle. Sit up straight and well back in theseat, distributing your weight evenlyin the seat. Do not apply excessiveweight to the outer side of theseats with a side airbag, and to thefront pillar, rear pillar and roof siderail with a curtain shield airbag. Do not allow anyone to get his/herhead closer to the area where theside airbag and curtain shield airbaginflate, since these airbagscould inflate with considerablespeed and force. Otherwise, he/shemay be killed or seriously injured.Special care should be taken especiallywhen you have a small childin the vehicle. Do not allow anyone to kneel onthe passenger seat, facing the passenger’sside door, since the sideairbag and curtain shield airbagcould inflate with considerablespeed and force. Otherwise, he/shemay be killed or seriously injured.Special care should be taken especiallywhen you have a small childin the vehicle. Do not allow anyone to get his/herhead or hands out of windowssince the curtain shield airbagscould inflate with considerablespeed and force. Otherwise, he/shemay be killed or seriously injured.Special care should be taken especiallywhen you have a small childin the vehicle. Do not attach a cup holder or anyother device or object on or aroundthe door. When the side airbag inflates,the cup holder or any otherdevice or object will be thrown withgreat force or the side airbag maynot activate correctly, resulting indeath or serious injury. Likewise,the driver and front passengershould not hold objects in theirarms or on their knees. Do not attach a microphone or anyother device or object around thearea where the curtain shield airbagactivates such as on the windshieldglass, side door glass, front andrear pillars, roof side rail and assistgrips. When the curtain shield airbaginflates, the microphone or otherdevice or object will be thrownaway with great force or the curtainshield airbag may not activate correctly,resulting in death or seriousinjury. Do not hook a hanger, heavy orsharp pointed objects on the coathook. If the curtain shield airbaginflates, those items will be thrownaway with great force or the curtainshield airbag may not activate correctly,resulting in death or seriousinjury. When you hang clothes,hang them on the coat hook directly. Do not use seat accessories whichcover the parts where the side airbagsinflate. Such accessories mayprevent the side airbags from activatingcorrectly, causing death orserious injury. Do not modify or replace the seatsor upholstery of the seats with sideairbags. Such changes may preventthe side airbag system from activatingcorrectly, disable the system orcause the side airbags to inflate accidentally,resulting in death or seriousinjury. Do not disassemble or repair thefront and rear pillars and roof siderail containing the curtain shieldairbags. Such changes may disablethe system or cause the curtainshield airbags to inflate accidentally,resulting in death or serious injury. If you wish to modify your vehicle fora person with a physical disability,consult your Toyota dealer. It maydangerously interfere with the SRSside airbags and curtain shield airbagsoperation. Do not perform any of the followingchanges without consulting yourToyota dealer. Such changes caninterfere with proper operation of theSRS side airbag and curtain shieldairbag system in some cases. This indicator comes on when the “IG−ON” mode is enabled. It goes off afterabout 6 seconds. This means the SRSside airbags and curtain shield airbagsare operating properly. Any of the SRS side airbags and curtainshield airbags have been inflated. The portion of the doors (shaded in theillustration) were involved in an accidentthat was not severe enough tocause the SRS side airbags and curtainshield airbags to inflate. The surface of the seats with the sideairbag (shaded in the illustration) isscratched, cracked, or otherwise damaged. The portion of the front pillars, rearpillars or roof side rail garnishes (padding)containing the curtain shield airbagsinside (shaded in the illustration)is scratched, cracked, or otherwisedamaged. The system monitors the weight andload on the front passenger seat, andthe seat belt buckle switch to determineconditions 1. through 4. Apply a heavy load to the front passengerseat. Attach a commercial seatback table,etc. to the front passenger seat seatback. Put weight on the front passenger seatby putting your hands or feet on theseatback from the rear passenger seat. The “AIRBAG ON” and “AIRBAG OFF”indicator lights indicate the actuation ofthe front passenger airbag, side airbagon the front passenger seat and frontpassenger’s seat belt pretensioner. The “AIRBAG OFF” indicator light will beilluminated when the “IG−ON” mode is enabledwith the condition 2 in the tableshown below. A rear passenger lifts the front passengerseat cushion with their legs. Objects are placed under the front passengerseat. The front passenger seatback is incontact with the rear seat. To ensure the system correctly detects anadult sitting in the front passenger seat,make sure the above do not occur. Make sure that the “AIRBAG ON” indicatorlight is illuminated when an adult isseated in the front passenger seat. If the“AIRBAG OFF” indicator light is illuminated,ask the passenger to sit up straight,well back in the seat, and with the seatbelt worn correctly. If the “AIRBAG OFF”indicator light still remains illuminated, eitherask the passenger to move to therear seat, or if that is not possible, movethe front passenger seat fully rearward. The “AIRBAG ON” and “AIRBAG OFF”indicator lights will be illuminated initiallywhen the “IG−ON” mode is enabled.After about 4 seconds, they willgo off. After that, the front passengeroccupant classification system operatesand judges which indicator light be illuminated. The SRS warning light and “AIRBAGOFF” indicator light will come on ifthere is a malfunction in the front passengeroccupant classification system. *1: The system judges a person of adult size as an adult. When a smaller adult sits in the front passenger seat, the system mayrecognize him/her as a child depending on his/her physique and posture. *2: When a larger child who has outgrown a child restraint system sits in the front passenger seat, the system may recognize him/heras an adult depending on his/her physique or posture. *4: When the front passenger does not wear a seat belt. *5: In case the indicator is not illuminated, see “Child restraint” on page 86 as for installing the child restraint system properly. Make sure the “AIRBAG ON”indicator light is illuminated whenusing the seat belt extender for thefront passenger seat. If the“AIRBAG OFF” indicator light isilluminated, disconnect the extendertongue from the seat belt buckle,then reconnect the seat belt.Reconnect the seat belt extenderafter making sure the “AIRBAG ON”indicator light is illuminated. If youuse the seat belt extender while the“AIRBAG OFF” indicator light isilluminated, the front passengerairbag and side airbag on the frontpassenger side may not activatecorrectly, which could cause deathor serious injury in the event ofcollision. Do not recline the front passengerseat seatback so that it interfereswith a rear seat as it may cause the“AIRBAG OFF” indicator light be illuminated.If the seatback interfereswith the rear seat, return the seatbackto a position where it doesnot interfere with the rear seat.Keep the front passenger seatbackas upright as possible when the vehicleis moving. Reclining the seatbackexcessively may lessen the effectivenessof the seat belt system. If an adult sits in the frontpassenger seat, the “AIRBAG ON”indicator light should be illuminated.If the “AIRBAG OFF”indicator light is illuminated, askthe passenger to sit up straight,well back in the seat, feet on thefloor, and with the seat belt worncorrectly. If the “AIRBAG OFF”indicator light still remains illuminated,either ask the passenger tomove to the rear seat, or if that isnot possible, move the frontpassenger seat fully rearward. Make sure the front passenger’sseat belt tab has not been left insertedinto the buckle before someonesits in the front passengerseat. Do not apply a heavy load to thefront passenger seat. Do not put weight on the front passengerseat by putting your handsor feet on the front passenger seatbackfrom the rear passenger seat. Do not let a rear passenger lift thefront passenger seat with their feetor press on the seatback with theirlegs. Do not put objects under the frontpassenger seat. Child restraint systems installed onthe rear seat should not contact thefront seatbacks. Do not remove the front seats. Do not kick the front passengerseat or subject it to severe impact.Otherwise, the SRS warning lightmay come on to indicate a malfunctionof the detection system. In thiscase, contact your Toyota dealer immediately. The “AIRBAG ON” indicator light may beilluminated (the front passenger airbag andside airbag on the front passenger seatmay deploy) even if observing the abovecautions, when a child sits in, or a forward−facing child restraint system isinstalled on the front passenger seat. Referto all the cautions in “SRS airbags” onpage 66 and “Child restraint” describedbelow.